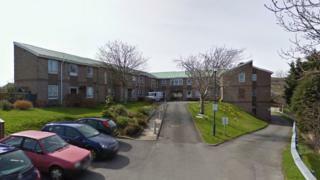 A recently closed care home building is at risk of losing value due to a lack of maintenance ahead of its sale, councillors have heard. Ceredigion council closed Bodlondeb in Aberystwyth earlier this year and is trying to sell the building. But one councillor raised concerns about the deterioration of the building and of children playing on the site. Council chiefs said the inside of the building was being kept in a good condition to maintain value. The state of the building, which closed after a 12-week consultation despite protests and opposition, was brought up during a meeting of the council's Cabinet on Tuesday. Councillor Alun Lloyd Jones raised concerns about the deterioration of the care home and revealed children had been seen playing at the site. Chief Executive Eifion Evans said the external areas had not been maintained but the interior had been in order to maintain value on the open market. The leader of the council Ellen ap Gwynn said maintenance staff were "keeping an eye on the building" but people could not be stopped walking through the site because a public highway goes through it. Councillor ap Gwynn said the site is currently for sale with "offers in".